A five-day road trip in North Africa takes you from the Sahara through Berber villages and dazzling scenery to Marrakech and, finally, the beach. Camel rides on the beach in Essaouira. After an assignment takes us to Morocco for seven very hot days of trailing 300 female off-road race car drivers through the Sahara, a friend and I decide we can’t leave the country without experiencing some of its storied bohemian glamour. We’ve breathlessly scaled towering dunes dotted with camels, and slept in tents we pitched ourselves, and had the sand in our hair to prove it. Now, we’re ready for some of the exoticism and luxury that have enticed travelers to Morocco for decades. We want snake charmers, labyrinthine streets, and opulent courtyards. 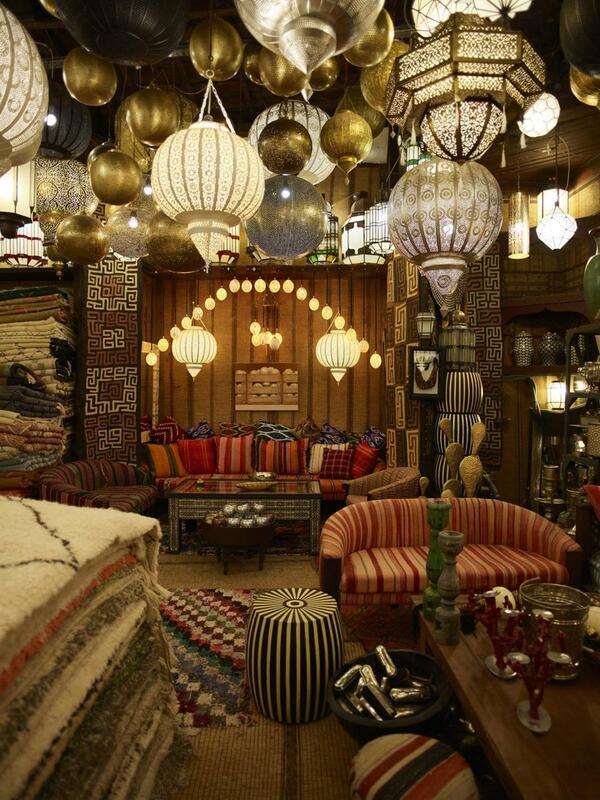 We want to haggle with vendors over rugs and poufs, then go for mint tea and tagine. We wouldn’t mind spending a few nights on real mattresses, either. And, inspired by our subjects, we want to do it all by car. What could be cooler than a road trip through Northern Africa? The four hours between the Sahara in central Morocco and Marrakech, to the northwest, had once been described to me as one of the world’s most scenic commutes, an endorsement I’d never forgotten. We can reach the Atlantic coast in just a few hours more, covering about 300 topographically diverse miles in about seven hours. It seems like a manageable enough adventure. We are told it will be tough to get lost — there’s basically one road — but that road is long, steep, and full of switchbacks and blind spots. We ponder going it alone but we are advised that our best bet is to hire a professional driver. I consult a friend at boutique travel agency Epic Road (epicroad.com) who’s done the drive before. He helps us plan our destinations and finds us a confident driver who can take us there over the course of five days. We’ll start in Skoura, an oasis town on the edge of the Sahara, and then make our way over the Atlas mountains, a sparsely populated range that spans Morocco, Algeria, and Tunisia, to the fertile Berber countryside. From there, we’ll travel on to bustling Marrakech before heading to the laidback coastal town of Essaouira, whose European-inspired medina — a walled inner city — is one of 10 UNESCO World Heritage Sites throughout Morocco. In recent years, Marrakech consistently ranks at the top of the world’s most popular destinations. 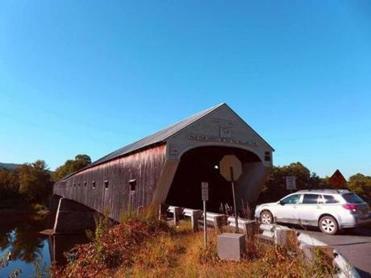 Part of the country’s appeal is how very different — almost otherworldly — yet relatively accessible it is, only 9 miles by water from Europe and seven hours by air from New York. (Royal Air Maroc runs daily direct flights into Casablanca from several cities, including New York and Washington, D.C.) From there, many travelers connect to another Moroccan city by air or train; to start a road trip like ours, you’ll want to fly from Casablanca into the city of Ouarzazate. The country is 98 percent Muslim, which is most evident in the call to prayer echoing loudly through the air several times a day, starting at dawn, and the fact that it can be difficult to get a cocktail (though not impossible). Overall, though, moderate Islam prevails. Most Moroccan women wear headscarves, but it’s not expected of foreigners, though I always dressed modestly, in pants or long dresses, even when it was hot. It’s easy enough to get by with English and I never felt unsafe or unwelcome. 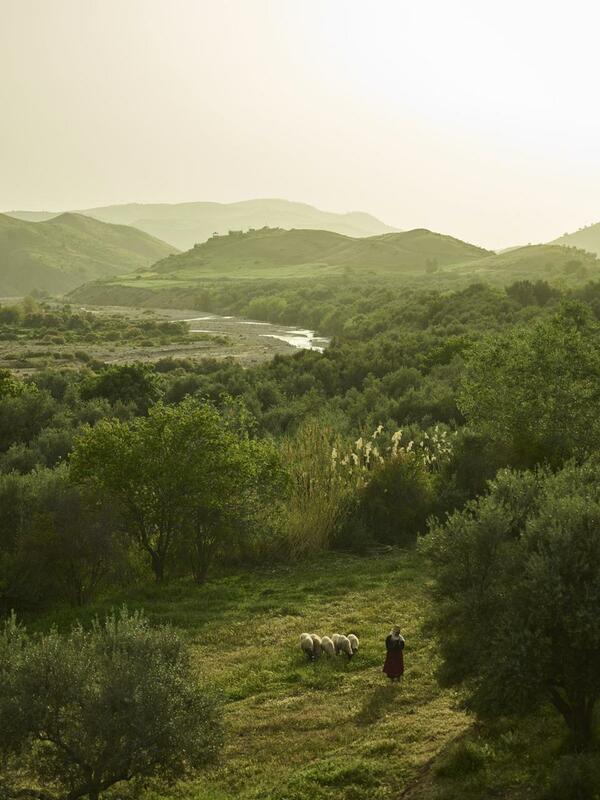 A shepherd tending a flock in Morocco’s Ourika Valley. Take four days to explore the region’s longest river and find extraordinary views, charming covered bridges, historic attractions, and more. Our first stop is Skoura, an oasis of olive, almond, and date palm trees bordering the Sahara that’s home to a series of Berber villages, as well as one of Morocco’s most luxurious hotels. Dar Ahlam (darahlam.com) — which means house of dreams — is a restored 19th-century kasbah on the site of a medieval sultan’s hunting grounds with just 14 rooms, tucked away at the end of a long dirt road, the sort of place that launches a vacation or provides its perfect landing. Founded by a Parisian event coordinator with a background in staging fantasy events, it feels less like a hotel than a magical movie set, halls surfaced in traditional Moroccan plaster and lit by candlelight; hidden corners stuffed with pillows and poufs. (I need to be redirected to my room more than once.) 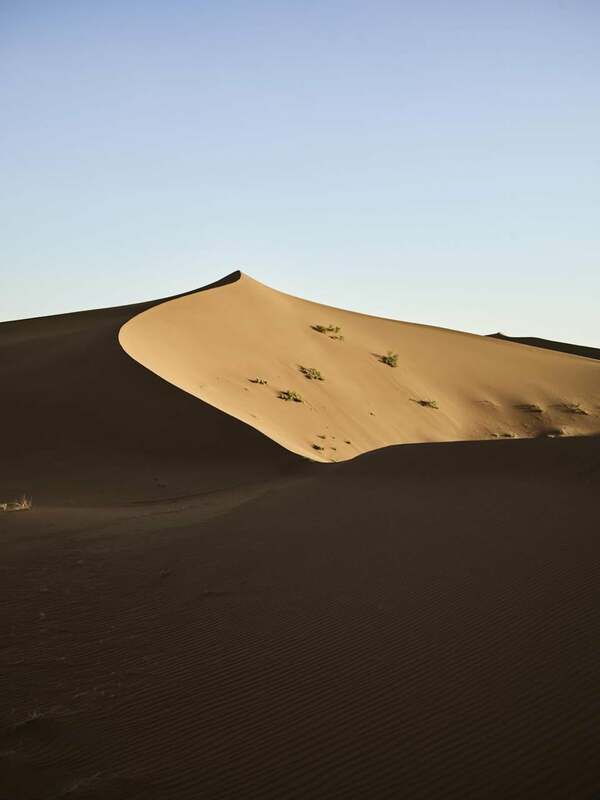 Guests come here to experience the desert via 4x4 excursions, enjoying champagne sundowners atop sand dunes, or on overnight outings to the resort’s remote tented camp five hours away. There are also day trips to explore centuries-old kasbahs and wander through the neighboring villages. But, says general manager Hicham Hraid-Rochette, just as many people come here to relax with a glass of Moroccan wine and a book by the sprawling, palm-shaded pool while they await their next meal, all of which are customized to guest preferences and held in surprise on- or off-site locations. Given we’d already put in some time in the dunes, this is basically how we spent our time here, fortifying ourselves for the road trip ahead. The next morning, after breakfast in the hotel’s damask rose-filled garden, we’re off. For centuries, the route from Skoura to Marrakech was used by desert traders to transport gold, ivory, and salt to the city, and although it now sees more traffic, and more tourists, in many ways it has not changed much over time. Over the next few hours, our car climbs through traditional villages, past Berber shepherds tending to their flocks. The landscape evolves by the half-hour; we see green fields in front of us even as snow-capped mountains remain in view behind. The hired car, meanwhile, is well worth the loss of our spirit of independent adventure, if mostly because the guardrail-less turns are left to a professional. Plus it allows us to more fully enjoy the incredible views, some from altitudes that reach as high as 7,000 feet. A towering dune in the Moroccan Sahara. Our second stop will be the countryside on the Marrakech side of the Atlas, opting to cross the mountains in one go. There are, however, several renovated kasbahs along the way that cater to those who want to spend some time in the mountains hiking, biking, or just cozying up to a roaring fire, including Kasbah Du Toubkal (kasbahdutoubkal.com) and Richard Branson’s Kasbah Tamadot (virginlimitededition.com/en/kasbah-tamadot). 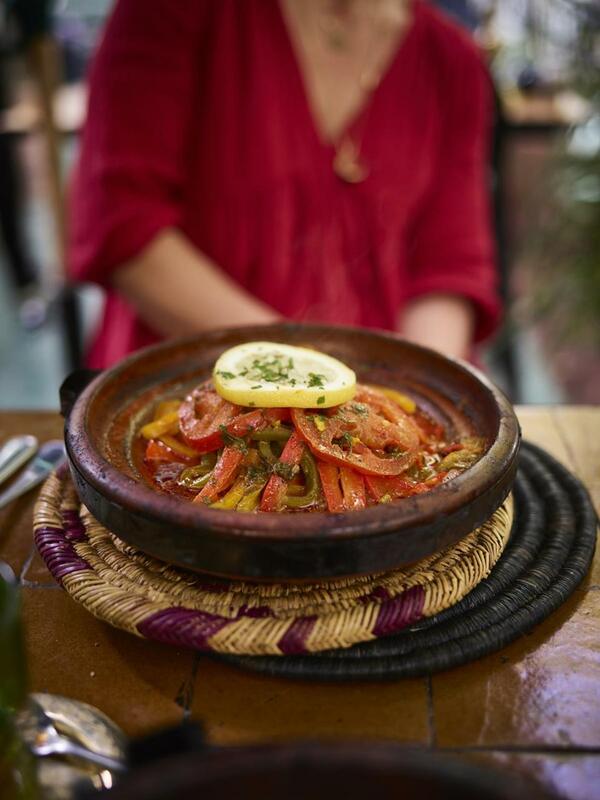 Tagine at Le Jardin in Marrakech. Rooms are constructed using traditional Berber techniques and materials (clay bricks, eucalyptus beams), arranged in Berber village tradition around a central house, and they’re elegantly, but sparingly, outfitted with vintage Moroccan textiles, rattan pieces, and locally made replicas of French antiques. Here, guests — an international mix of low-key arty types — gather for fireside cocktails and seasonal Mediterranean-Moroccan meals, like chicken tagine with quince and poached peaches with lemon verbena, that draw from the property’s organic garden. 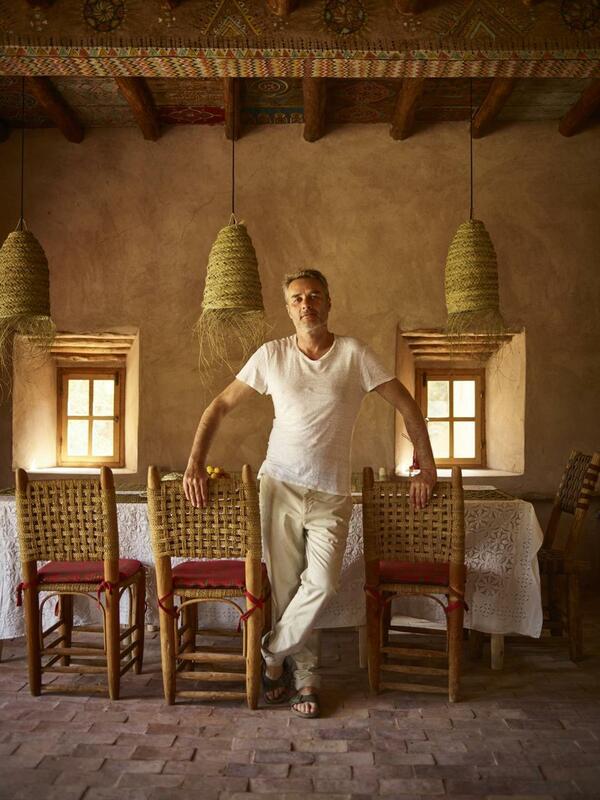 Fittingly, while the lodge can arrange such activities as Berber market outings, shopping trips to Marrakech, and cooking classes, most guests, Michel-Meniere says, are quite happy to spend their time doing little more than drinking mint tea and enjoying the view. After a few nights, we say our goodbyes and pile back in the car to head to Marrakech. A former imperial city, it offers no shortage of design feats in the form of palaces, gardens, museums — including the new Musee Yves Saint Laurent at Marrakech’s historic Jardin Majorelle — and some of the world’s most beautiful hotels. Its medina, the walled-in Arab quarter, contains an estimated 1,000 riads, traditional courtyard mansions now operating as guesthouses, as well as most of the shops, or souks. Riads can range from the classically Moroccan (glazed ceramic tiles, painted wooden ceilings) to the muted and ultra-modern, and run akin to bed and breakfasts, with no in-house restaurants but attentive staff on hand to offer a coffee, a cocktail, or a full meal as you like. At Michel-Meniere’s suggestion, we opted to stay at Riad Mena, a tiny six-room riad about a 10-minute walk from the snake charmers and Barbary monkeys of the famous Jemaa el Fna square (riadmenaandbeyond.com). The riad began as a private house for owner Philomena Merckoll’s mother to live in when she retired and it retains the homey vibe of staying in a good friend’s place. Merckoll and Michel-Meniere collaborated on interiors that pair Moroccan flourishes with midcentury minimalism, much of it purchased from around the medina. Mustapha Blaoui’s eponymous shop in the Marrakech medina. Merckoll travels between London, Germany, and Morocco but when she’s at the riad, she’ll gladly share with guests, as she did with us, her recommendations for restaurants (Nomad, Le Grand Cafe de la Poste, Le Jardin); shops (Chabi Chic, Soufiane Zarib); and spots for art (Le 18, Galerie 127) and culture (Dar Yacout, for live Gnawa music, Le Comptoir for belly dancing). But, she adds, visitors could (and should) easily explore the twists and turns of Marrakech’s dusty streets for weeks and find plenty of gems on their own. Although many frequent travelers to the city might say that price shopping or haggling with the vendors in the souks is part of the fun — especially those who come here for home goods — if you’re short on time (or not in the mood), the best one-stop shopping is at Mustapha Blaoui, a Westerner-friendly destination featuring three levels of the best the souks have to offer. You’ll pay more, but you’ll have time left over to catch the sunset over the square at La Terrasse des Epices, one of the few spots in the medina to get a drink (terrassedesepices.com). Most hotels and riads can also help you find a local guide who can help narrow your focus — whether it’s ceramics, rugs, poufs, lanterns, spices, or all of the above — then take you to the best shops and help you negotiate decent prices with minimal haggling. Best of all, when you’re finished you won’t have to lug your purchases around, as most shops can arrange for shipping. It’s hard not to go overboard — there are more than 3,000 souks, and they’re all packed to the rafters with appealing things to buy. But once we have our fill of shopping, we’re back in our car and heading west toward Essaouira, a two-hour drive through fertile valleys overrun with argan trees and one of Morocco’s top-producing wine regions. We stop for lunch and a glass of rose at Les Domaine du Val D’Argan, a 120-plus-acre winery that also hosts overnight guests (valdargan.com). Berber Lodge proprietor Romain Michel-Meniere. Entering the working fishing port of Essaouira — which used to be called Mogador — the air changes and so does the vibe, with sun-bleached buildings inspired by contemporary European military architecture. The medina is smaller than the one in Marrakech, though still filled with shopkeepers selling spices, cotton caftans, and leather goods. 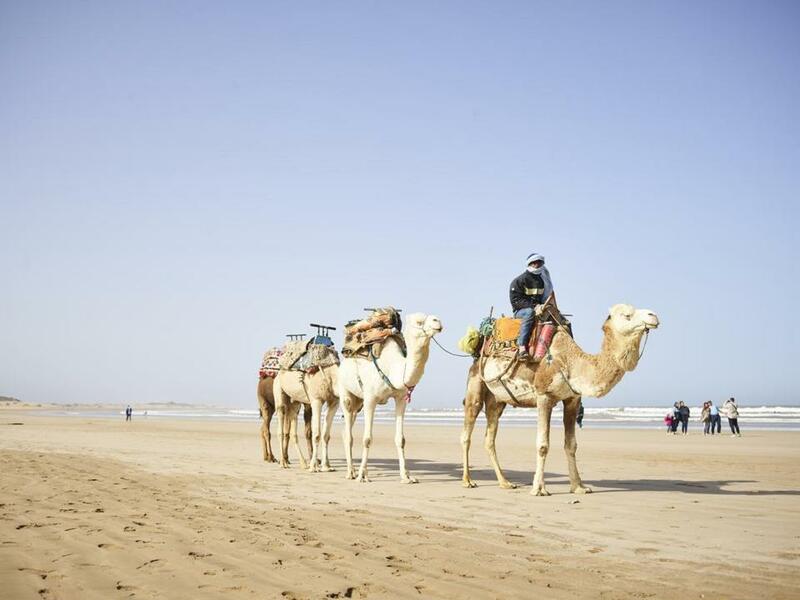 Instead, Essaouira’s real draw is the beach, where locals windsurf and pull in fresh catch, and camels give rides along the sand. We spend a few nights at Dar Maya (riaddarmaya.com), a hidden gem of clean design in the center of the medina, owned by ex-Londoner Gareth Turpin, though we also heard good things about the oceanfront L’Heure Bleue (heure-bleue.com), a Relais & Chateaux property offering a more traditional hotel setup. On our last night, Turpin directs us to eat at the bar at La Table by Madada (madada.com), where our surprisingly stiff cocktails are paired with seafood so fresh, our waiter informs us, it had just come in about a half-hour ago. The restaurant also offers cooking classes, and there’s a boutique hotel upstairs, as if to say: Come for dinner. Stay as long as you like. The offer, we have to admit, is tempting. 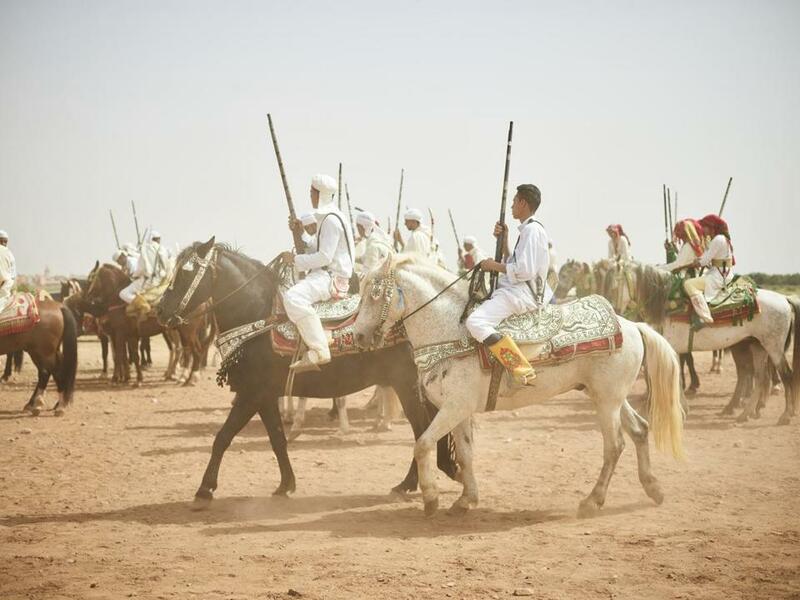 Performers ready for a display of fantasia (above), a traditional folklore show of horsemanship. 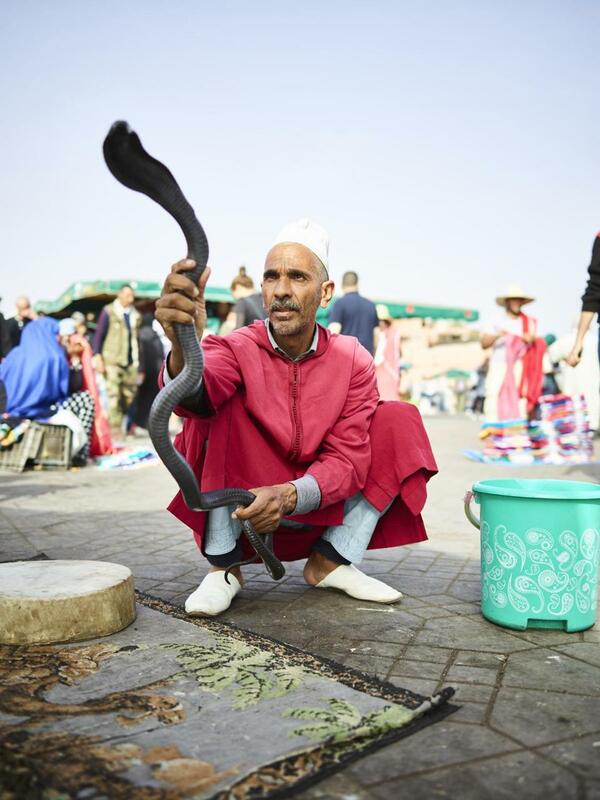 A snake charmer in Marrakech’s Jemaa el Fna square. Alyssa Giacobbe is a regular contributor to the Globe Magazine. Send comments to magazine@globe.com. Get the best of the magazine’s award-winning stories and features right in your e-mail inbox every Sunday.Sign up here.